I baked three fruit cakes before Christmas, off the top of my head I think it was two 10″ cakes and one 8″, but the ratio might be slightly different! I baked two large cakes because we were having a party for friends at home when we returned from honeymoon. I decided to be like the Queen, a cake to cut and a cake to look nice! I effectively had two bottom tiers, so I could reconstruct the cake for the second party with the second cake! I suggested this to a friend of mine whose daughter was having about 100 guests to her 21st, she baked two spare plainly decorated cakes which could be cut up and bagged up in advance so my friend didn’t spend the party cutting up cake! Having looked at lots of ideas I was finally inspired by a photo on the wall in the Home and Kitchen shop in Skipton (Excellent Shop!) 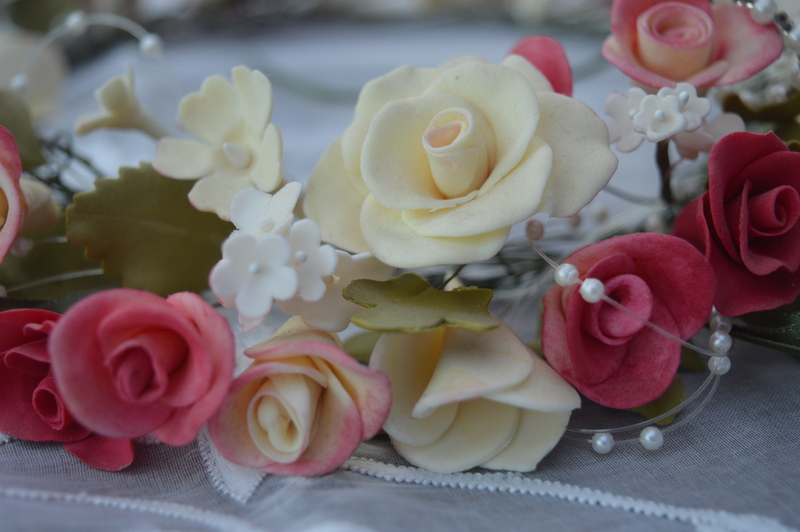 I made lots of flowers from flower paste…and I mean LOTS of flowers!!. Flower paste dries really hard and it can be rolled out so thin you can see through it! It also lasts along time, I’ve still got the arrangements I made, the photos of close-ups were taken yesterday, a bit dusty, a bit faded, but otherwise still looking good! 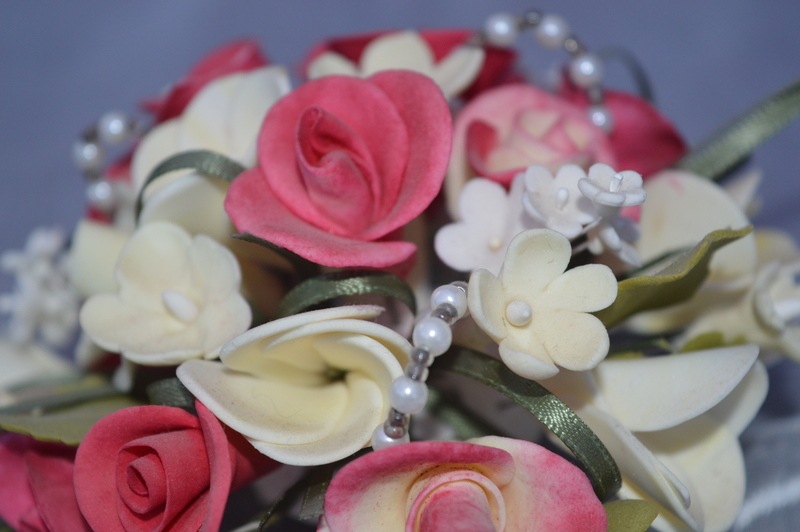 I made roses, frangipani (an Australian flower as I married an Australian!) filler flowers, freesias, roses were brushed with dusting powder to vary the colour. 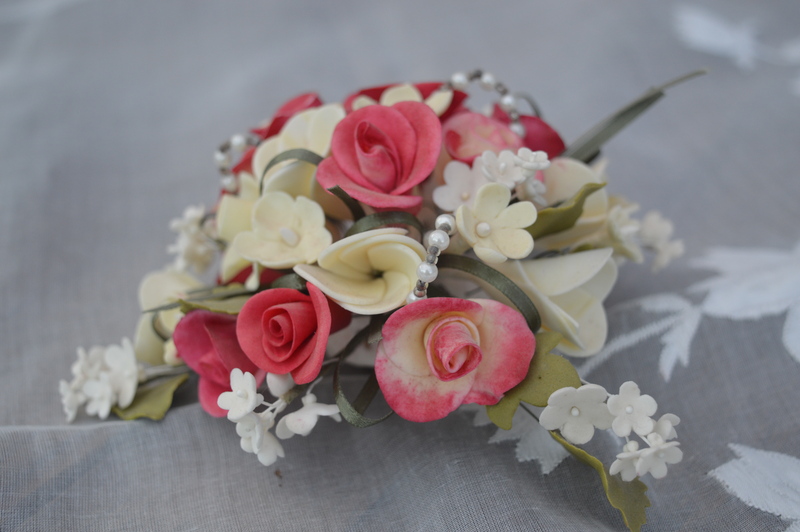 I made rose leaves and also twisted ribbon and pearls onto wire. Everything was made, ready to use by the end of February. 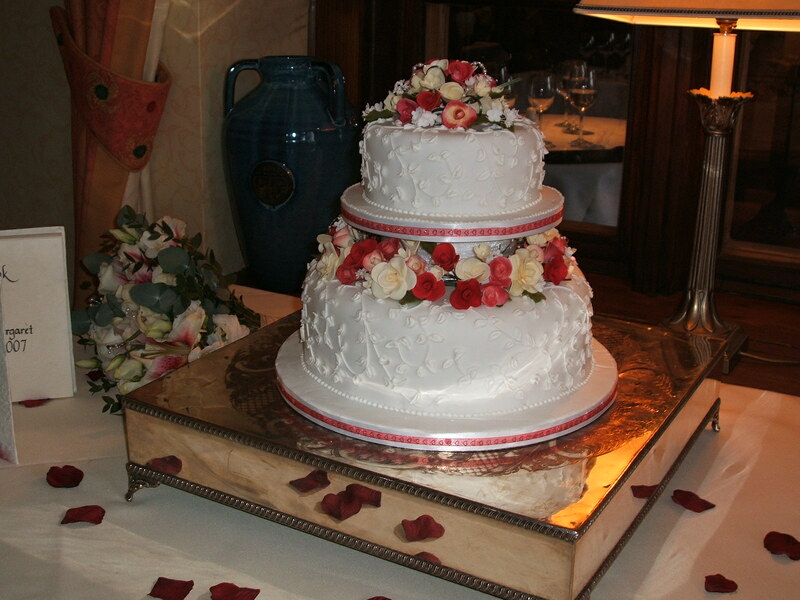 I made a small arrangement to go on the top of the cake and then a ring of flowers to go on the middle tier. 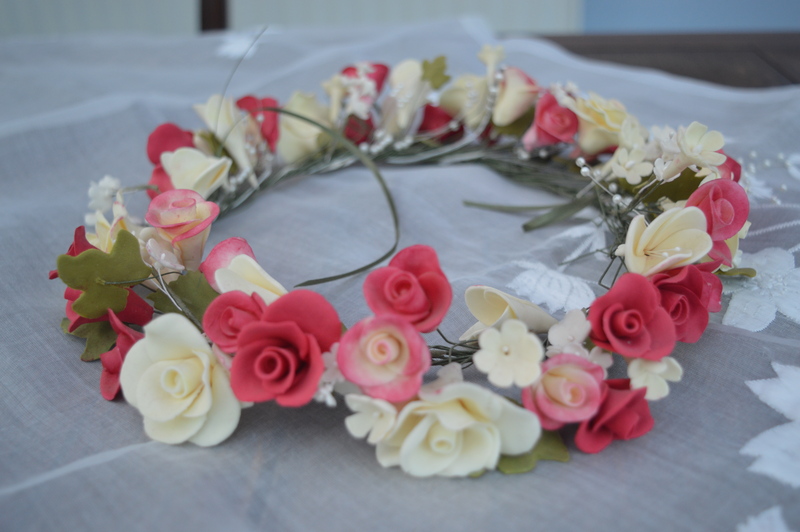 I made it a bit like a circlet of flowers for the hair, so it could be lifted on and off. You can see from the photos how it was all wired together. It took ages to work out how to support the top tier as I only wanted about 2 1/2″ difference, most supports you can get in the shops are not as narrow. In the end I made something from polystyrene and plastic rods. I have to admit though that when it came to our honeymoon party I used a cereal bowl and it worked perfectly! My biggest stress was the royal icing on the side of the cake, the design I chose had an all over iced pattern! I discovered that an icing tube I had in my collection did a leaf design. I used the Christmas Cake as a practice that year! I was very relieved on the day to find out the cake looked good! My opening comment to the photographer when he came out of the reception room was ‘Does the cake look ok?’ which really meant ‘Is the cake still standing?’ I was very reassured when he looked surprised to discover I had made it myself. Even better was when I found it tasted good too, especially when served with Wensleydale cheese, a Yorkshire tradition. This entry was posted in Wedding and tagged wedding, Wedding Cale. Bookmark the permalink. That’s amazing! and self taught too! Thank you, I’d love to do a royal icing course, learn to do it properly, but these days evening classes seem to be mainly sugarpaste. Is there anything on craftsy? Fabulous cake. 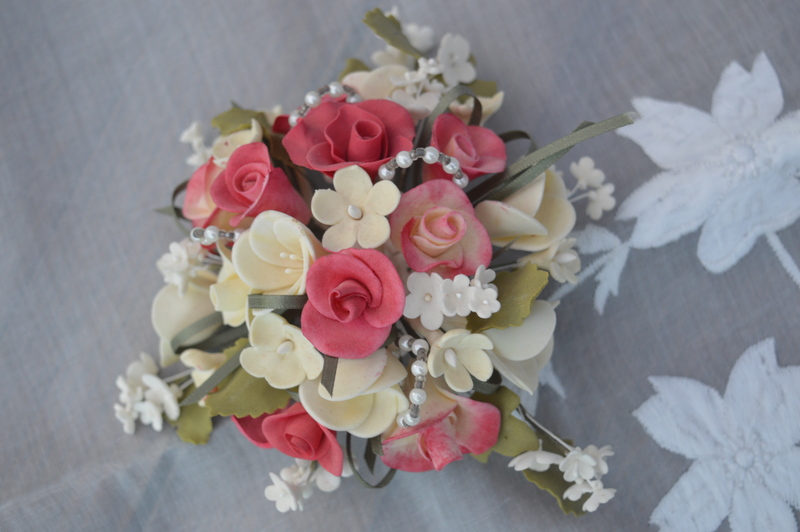 I still have the sugar paste flowers from my (first wedding!) wedding cake. My mum made them. All lilies and ivy. Thanks Lucie, it’s amazing how long they last, I’ve still got the arrangement I made for my daughter’s Christening cake 17 years ago!